Find even more answers in volume two of this remarkable resource for youth and leaders. With a wide spectrum of topics, arranged in a logical sequence, you can easily adjust your talk, lesson, or missionary message to just the right length. 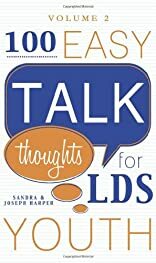 Learn more about the truths you hold sacred in this priceless resource that no LDS teen should be without! About Joseph Harper (Author) : Joseph Harper is a published author. A published credit of Joseph Harper is 100 Easy Talk Thoughts for LDS Youth, Volume Two.